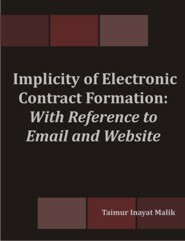 This research is conducted with an intention to have an overview of the contracts made online, what possible difficulties can arise within such commercial transactions and to assist readers upon the legal ambiance which environs it. The author is an Advocate of the High Court in Pakistan. He is also Senior Lecturer at Bahria University and is the youngest lawyer whose first case got reported in the Supreme Court of Pakistan. The case was headed by 17 judge larger bench and was on the 18th Amendment in the Constitution of Pakistan.